3D Blank Maps of cities and town in the world, and in Japan. 3D JUMBO LAND will produce a 3D blank map with any terrain surfaces in the world. 3D blank map of prefectures / cities / towns in Japan, and cities all over the world. 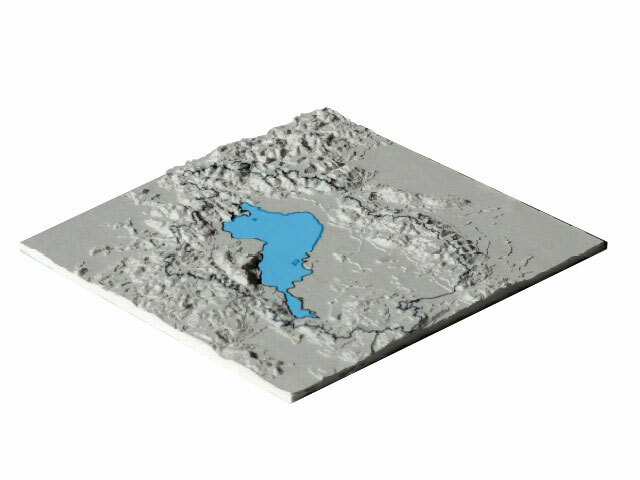 In any country there are a lot of cities and town, and they all will be shown their figures by printing with our 3D Printer as 3D blank map for customer's sake. It's a hand holding size because of created by paper as material, and it's easy to bring out for displaying to your mates outside. Comparing to 2D blank Map, 3D blank map can present more reality, instinctive visualization, and 3D structure only at a glance. But for blank map, it will make a chance to draw lines and object as you like, and to take any kinds of record you want to store on your hand-holding 3D blank map. For memory of a visited location, painting on actual transfered paths. For tutorial tool of waling and cycling course. For painting to make a fine arts as your favor. For storing records of sociological study. For mapping of must-seeing spot, famous ancient site. For announcing evacuation route from earthquake, tsunami and land slide disaster. 3D blank map of Shiga Pref. You can make an order these 3D blank map in 3D JUMBO LAND, see blow in detail. How to order 3D blank map of citis and town in Japan and the world. Open 3D Jumbo Land Page at the list of cities in Japan, and click the target page you want. A order page of 3D map you looking for will be on screen, and choose "All white" in term of "coloring". That's all you've to do, so easy to purchase a 3D blank map you want, right? Move to List of 3D map, 3D blank map of cities and towns in Japan. Please access to 3D Jumbo land top page for the list of cities and towns of other countris in the world. >Feel free to ask any question and inquiry. You can make an order by clicking Here !